BROOKLYN, N.Y. (CNS) — The ritual of remembrance continues. 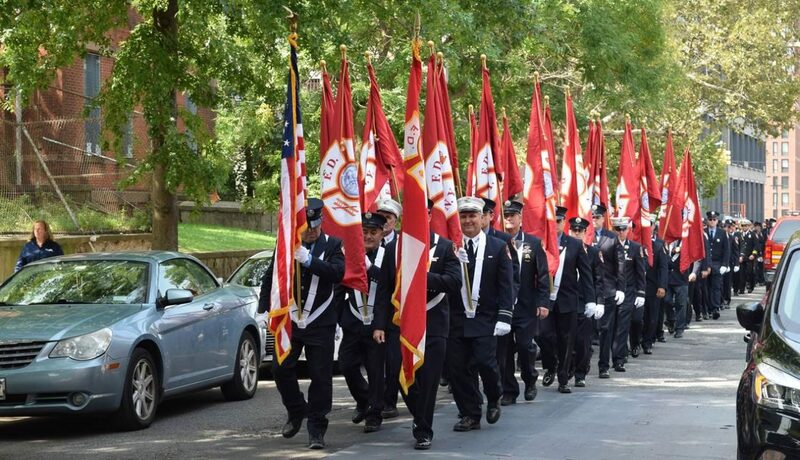 Just as in previous years, Fire Department of New York Battalion 57 marched 2.5 miles from the World Trade Center, across the Brooklyn Bridge, ending at the Co-Cathedral of St. Joseph in Brooklyn to remember the fallen heroes of the 9/11 attack on the World Trade Center in 2001. Father Sean Suckiel, vocations director for the Diocese of Brooklyn, celebrated the memorial Mass at the church, praying for those who lost their lives and blessing the first responders still on the job. “That day we were shocked, we were wounded,” Father Suckiel recalled. “Evil that day has its moment of triumph. That was a day of horrific events that we must never forget. “When truly challenged, we forget ourselves and we become men and women for others, men and women who are willing to give up their lives. In times of disaster, we are present for one another, we change, we become our best,” he said. Firefighter Keith McElwain remembered driving through the tunnel into Manhattan and “when we got out, the clouds of smoke were everywhere and most of us didn’t know the towers had fallen yet. But I knew my brothers were in there and I had to bring them home. Firefighter Thomas Palombo graduated from the fire academy in 2015. His father, Frank Palombo, a graduate of Cathedral Prep School and Seminary in Queens, was killed on 9/11. Firefighter Billy Stark marched for the 14th consecutive year and doesn’t plan on stopping. “Every year the march seems to get a little tougher, but we keep going,” he said. Twenty-three members of Battalion 57, located in the Bedford-Stuyvesant neighborhood, lost their lives at the World Trade Center. “Of our battalion, we only recovered a femur of one firefighter. That was it,” Stark said. O’Connor is on the staff of The Tablet, newspaper of the Diocese of Brooklyn.